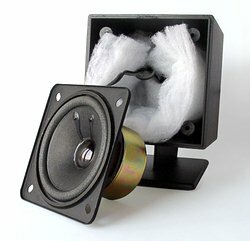 Unfortunately, an inexpensive 5.1 acoustic system for a computer is a compromise between price and quality. 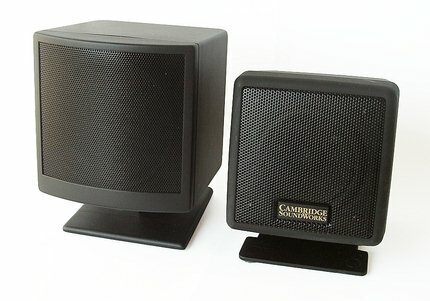 Since an average user doesn't require super quality of sound, the most companies lay emphasis on appearance of speakers and a package - nothing else is allowed by the limited prime cost. It happens quite often when acoustic systems come from little known companies. But it is different with a respectable company. First of all, such manufacturer pays great attention to quality of the components, and if he is not able to develop something himself he chooses a reliable partner. Secondly, companies which are steady on their legs can afford to sell products with the lowest profit to crowd out their competitors. This is what impressed me when I saw the inexpensive XPS 510 5.1 acoustic system. 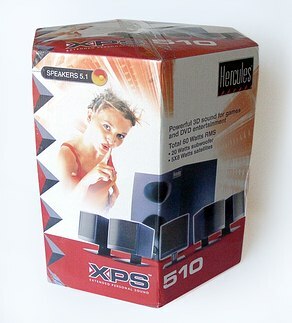 Hercules (which married Guillemot in 1999) does mean business on the market of audio products for PC. If you remember, last year the company successfully showed off multifunctional Game Theater XP sound card and managed to press for a certain time such monster as Creative. This time the company made a breakthrough in the sector of low-end 5.1 acoustic systems (note that Low-End refers to below $150, Middle-End - $150-250, and High-End - over $300). All the stuff comes in a package looking like a hexahedral prism. The unusual shape and the weight of just 10 kg simplifies transportation much. The user manual (written in several languages) contains two pictures which clearly show how to assemble the system and place it out in your computer corner. The cables which connect the system to a sound card (minijack/minijack) are 1.5 m long; those which have miniDIN connectors are 2 m. Such length is optimal because the system is designed only for a PC user's workplace. 5 identical satellites have geometric regular proportions; the dimensions of the speakers are not great: 92 x 92 x 97 mm. On the photo below you can see the speaker together with that from Creative. Such dimensions make no problems when arranging them on the desk. All satellites have supports which lift a bit the directional diagram of the loudspeaker. It is possible also to hang the speakers on the wall (in this case the support can be taken off. The supports have 4 round legs made of soft rubber. The speakers have the "sealed box" acoustic scheme. The cabinets are made of 3mm plastic. The batting inside eliminates any plastic sounds. The loudspeaker's cone of 68 mm in diameter is made of paper; the flexible corrugation of the cone is made of polypropylene; the impedance of the dynamic loudspeaker is 4 Ohm. The magnets in the loudspeakers are shielded, that is why the satellites placed close to a monitor do not induce noise. The protective grills are made of thin metallic alloy; they are made as a plate with a lot of small holes, like a sieve. There are no any connectors on the back side of the satellites, the cable goes into the cabinet. The cables for the front and central satellites are 3 m long, for the rear ones they are 10 m long; all cables are well isolated. 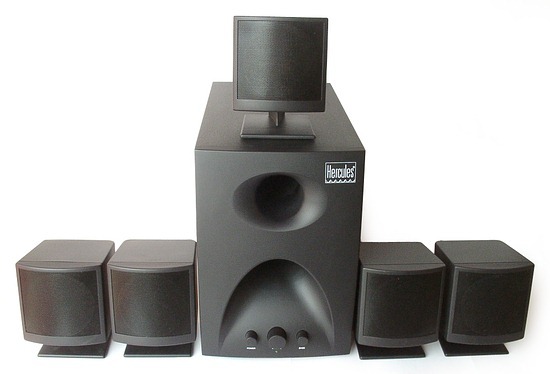 The subwoofer measures 170x235x320 mm. But remember that sound quality and dimensions are not directly interrelated. It often happens that a huge sub plays awfully. Besides, the class this model belongs to doesn't provide for large subs. Here you can find a power button and a power indicator, a general volume control and a subwoofer's one. 5 outputs (RCA) for speakers. The input for the left and right front satellites (above on the photo of the rear panel) serves also as an analog stereo-in for different stereo devices. The input with the G9 connector is meant for 6-channel connection to sound cards with the same interface (the cable is supplied). The cabinet of the subwoofer is wooden (pressboard); all panels are 12 mm think. Note that joints of the panels and partitions are glued accurately and hermetic. The subwoofer has the "resonance chamber" acoustic scheme. As you know, one of the advantages of such scheme is high efficiency at small dimensions. The resonator's hole is output onto the front panel which is made of plastic. The subwoofer has 4 rubber legs, each 1 cm high. The amplification section contains high-quality one-channel TDA2030A chips from ST Microelectronics for all of 6 channels. The chips have thermo grease on them and they are pressed through insulant against the heatsink with two metallic plates (we've taken them off for the photo). Power comes from an m-type transformer which is placed very close to the amplification card. The latter contains two 6800 mF capacitors (!) which provide protection from penetration into the sound a low-frequency noise caused by alternating current. 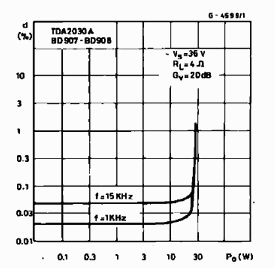 Let's take a look at the diagram showing how the distortion level depends on power; the diagram is taken from the TDA2030A chip specification. We measured voltage on the respective chip's outputs and got +/-17.5 V. We can make no correction for the power axis for this diagram, and in this case we get more decent power values for such acoustic system at a low distortion level. Well, the amplification section XPS510 is not a bottleneck which causes problems in many other models of this class. The listening tests were carried out with a computer without a cooler on the processor and with the switched-off fan on the power unit. All noise sources were put away. The audio compositions were played on the professional sound card Hoontech DSP24Value with the AKM AK4524 codec, 5.1 tracks of the DVD movies - on the Live!5.1 card. This system sounds very well with the testing material we used. We noticed no additional sounds and resonances when listened to it at the acceptable volume level. This is because the cabinets have batting inside. The speakers placed as far as 1m from each other made quite good 3D sounding. The volume level is enough for a computer corner. But the sound is not transparent enough and lacks for normal mid frequencies. The dynamic loudspeaker of the satellite plays the whole mid and high range alone, which brings in specific tinge and makes you tired if played for a long time. (Note that this is typical of many acoustic systems which consist of a wooden subwoofer and small plastic speakers). That is why it's better to listen to music on the XPS510 in the background mode, while working. The lowest frequencies are not played entirely. Bass parts of this range sound dimly. Sometimes it is even impossible to define a pitch of a played note. If we compare the XPS510 with the competitive Creative DTT2200/DTT3500, we will see that the Hercules' satellites win here, though the Creative's subwoofers sound much better. The system plays quite well sound tracks of the DVD movies. But if you are going to buy a system exactly for watching movies, you should go with more expensive wooden 5.1 systems. The Hercules XPS510 can produce sound only for a user's workplace. At a higher volume level the sound becomes screaming and with a great deal of distortions. All of 5 speakers are identical, but the mid-range frequencies don't allow dialogs get lost. I wouldn't recommend to place the rear speakers too far away because they have a limited volume level, but this doesn't worsen 3D sounding. Here the deficient sound of the subwoofer in the low range is not very important. The subwoofer delivers explosions verisimilar. I was even surprised at its capabilities taking into account that its dimensions are quite small. Remember that you shouldn't consider the Hercules XPS 510 as a normal acoustic system for a home theater; in the subjective tests we accounted for the price and dimensions of the system. The tests are carried out according to the single testing technique for all speakers, using the RMAA AE 3.3 program. Well, the working range is, in fact, from 350 Hz to 15 kHz. Although the flatness is +/-6 dB (which is quite acceptable for this system), at high frequencies the line is much broken, and there is "hump" at 2 kHz. By the way, there are no resonances at all in the whole working range. The subwoofer was tested at a quite high volume level. The working range for the XPS 510 is from 50 Hz to 200 kHz. The distortion level at the lowest frequencies is quite high. The less louder the sound, the less the distortions, but it also narrows the range of produced frequencies. The subwoofer of this system is not meant for normal playback of the lowest frequencies. When the test signal of a high volume level is applied, there are distortions and additional sounds. The Hercules XPS 510 5.1 acoustic system made a good impression on us. In its class it takes far not the last position and it really is worth considering when you choose miniature speakers for your PC. The subwoofer which is not too big plays quite well, and the satellites sound better than even the Creative DTT3500. On the whole, the system is of high quality.